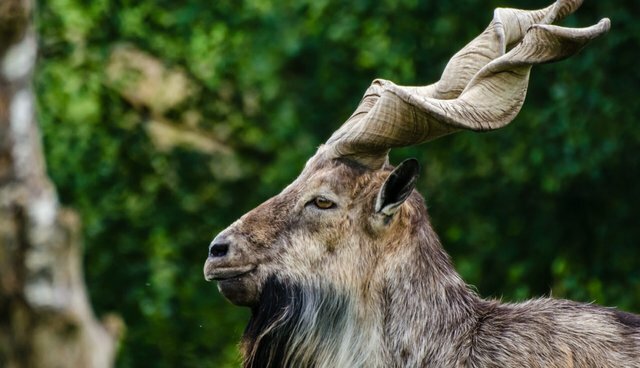 Pakistan's national animal, the twisty-horned goat called the markhor, is edging away from extinction, according to the United States Fish and Wildlife Service. A once-common sight in Pakistan's Torghar hills, the goat population began to crumble in the face of local turmoil, sparked by the nearby Soviet war in Afghanistan. Not only were the goats casualties from artillery fire in the war - which began in 1979 and lasted for a decade - but an influx of guns and ammunition lead to increased markhor hunting. By 1984, only 200 markhor remained in the area. But now-quieted cannons and reduced hunting, stemming from a joint initiative by the USFWS and local groups like the Torghar Conservation Project, have allowed the markhor to reclaim their rocky hills. Poaching has all but vanished as well, following the hiring of 80 Pakistani rangers. Considering the markhor population now numbers roughly 3,500 wild goats, the USFWS announced Monday that the goats will be listed as vulnerable, rather than threatened, under the Endangered Species Act. I don't understand the desire to kill a magnificent animal for sport, even if the individual is an older non-breeding male. The sale of the right to kill an animal for a trophy surely reflects the value that animal lives hold in at least some corners of our society: that killing an animal for fun isn't wrong, as long as you can afford it. It is right to worry about the sort of message that sends. But if an endangered species as charismatic as the black rhinoceros is under such extreme threat from poaching, then perhaps the message that the species needs saving has a larger problem to address than the relatively limited loss of animals to wealthy hunters. For Pakistan's Torghar Hills markhor - who are about as rare as black rhinos - the trophy licences must continue to "demonstrate a benefit of hunting to both the local communities and the species," the USFWS says. A rocky path to recovery, but a path nonetheless.